a membranous fold in a canal or passage that prevents backward flow of material passing through it. aortic valve a semilunar valve that separates the left ventricle and the aorta; it opens with end diastole, causing the second heart sound. atrioventricular v's the cardiac valves between the right atrium and right ventricle (tricuspid valve) and the left atrium and left ventricle (mitral valve). bicuspid aortic valve a congenital anomaly of the aortic valve, caused by incomplete separation of two of the three cusps; it is generally asymptomatic early in life but is predisposed to calcification and stenosis later on. Braschi valve a one-way valve put into the inspiratory limb of a ventilator circuit in order to measure the intrinsic positive end-expiratory pressure. 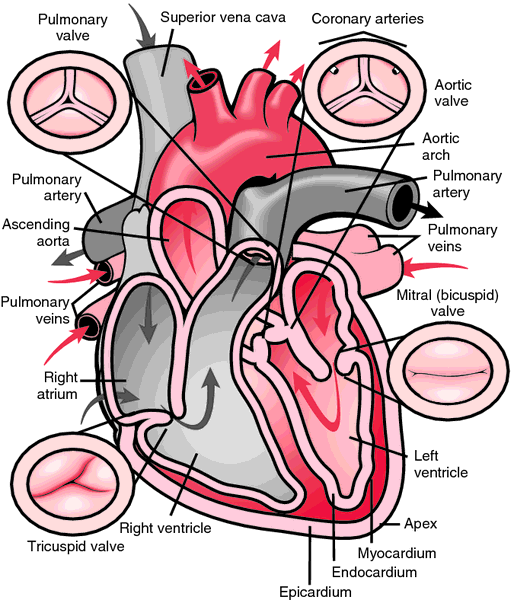 cardiac v's valves that control flow of blood through and from the heart. coronary valve a valve at the entrance of the coronary sinus into the right atrium. flail mitral valve a mitral valve having a cusp that has lost its normal support (as in ruptured chordae tendineae) and flutters in the blood stream. Heimlich valve a small one-way valve used for chest drainage, emptying into a flexible collection device; the valve prevents return of gases or fluids into the pleural space. The Heimlich valve is less than 13 cm (5 inches) long and facilitates patient ambulation; it can be used in many patients instead of a traditional water seal drainage system. ileocecal valve (ileocolic valve) the valve guarding the opening between the ileum and cecum. mitral valve the cardiac valve between the left atrium and left ventricle, usually having two cusps (anterior and posterior). Called also bicuspid valve. Valves of the heart. The right heart pumps the venous blood into the lungs. The oxygenated blood returns from the lungs into the left atrium and is propelled by the left ventricle into the aorta. The insets show closed valves: the tricuspid valve has three leaflets, whereas the mitral valve has two leaflets. The aortic and pulmonary artery valves have three leaflets and resemble one another except for the fact that the coronary arteries originate from behind the cusps in the aorta. From Damjanov, 1996.
posterior urethral valve any of various types of congenital folds across the proximal part of the male urethra near the seminal colliculus, the most common cause of urethral obstruction in male infants. pulmonary valve (pulmonic valve) the pocketlike cardiac valve that protects the orifice between the right ventricle and the pulmonary artery. pyloric valve a prominent fold of mucous membrane at the pyloric orifice of the stomach. semilunar v's the cardiac valves that have semilunar cusps; see aortic valve and pulmonary valve. tricuspid valve the cardiac valve guarding the opening between the right atrium and right ventricle. valve of vein (venous v's) any of the small cusps or folds found in the tunica intima of many veins, serving to prevent backflow of blood. a small one-way valve used for chest drainage that empties into a flexible collection device and prevents return of gases or fluids into the pleural space. The Heimlich valve is less than 13 cm (5 inches) long and facilitates patient ambulation. It can be used in many patients instead of a traditional water seal drainage system. A technique for removing a foreign body, such as a food bolus, from the throat, trachea, or pharynx of a choking victim, where it is preventing air flow to and from the lungs. Synonym: abdominal thrust maneuver. For a conscious victim, the maneuver consists of the rescuer applying subdiaphragmatic pressure by wrapping his or her arms around the victim's waist from behind, making a fist with one hand, placing it against the patient's abdomen between the navel and the rib cage, and then clasping the fist with the free hand and pressing in with a quick, forceful upward thrust. This procedure should be repeated several times if necessary. If one is alone and experiences airway obstruction caused by a foreign body, this technique may be self-applied. For the unconscious victim, starting CPR is now the recommended procedure because chest compressions are often effective for removing a foreign body. It is a simple method that can be taught to the general public. When the patient is a child and can speak, breathe, or cough, the maneuver is unnecessary. If the maneuver is done, it should be applied as gently as possible but still forcibly enough to dislodge the obstruction (the abdominal viscera of children are more easily damaged than those of adults). This treatment is quite effective in dislodging the obstruction by forcing air against the mass, much as pressure from a carbonated beverage forcibly removes a cork or cap from a bottle. The average air flow produced is 225 L/min. Harry J., U.S. thoracic surgeon, 1920–. Heimlich maneuver - a method used to expel an obstructing bolus of food from the throat. a valve placed on an indwelling catheter to prevent reflux of air into cavity being evacuated, as in drainage of the pleural cavity.